We've had our stove and chimney checked out twice by the local chimney sweeps/installers and they have been very helpful in pointing out shortcomings and possible improvements to our installation. Just this past spring they were out to add a foot to the height of the chimney, as well as replace the original silicone roof boot with a metal one that would be WETT certified. While we don't currently intend to entertain house insurance, it is personally worth striving to be compliant with their safety standards. One item that I was willing to tackle myself was replacing the heat shield behind our stove with something permanent and of proper sizing. Originally we had simply brought in the standup shield we were using in the yurts, and it has served us well for the past number of seasons. But, it was far too small and easily removeable shields are not able to qualify for WETT certification (and, by extension, insurance). There were a few stipulations that I could recall - it had to be between 1 and 3 inches off the floor, extend 18 inches beyond each side of the stove, and extend a certain number of inches above the stovetop. I can't at the moment remember this figure, but I know I'm way beyond that. It's very handy that the stove is almost exactly thirty-six inches wide. I ordered up some standard roof steel that is itself thirty six inches of coverage. Two of them side-by-side give me seventy-two inches of width. That gives me the eighteen inches on either side nearly perfectly! It was also a requirement that the heat shield not be installed directly to the wall, but that it needs to be screwed to something else, that is in turn screwed to the wall. You can't even use long screws to finish the install as they could conduct heat from the head of the screw directly into the wood of the wall. So, I ordered four sheets of my steel. I installed two of them directly to the wall, and then installed the remaining two to the first two with the coloured (black) side facing out. The ribs were oriented vertically, mostly because I thought that would look the nicest and collect the least dust, but another key consideration is that according to code, your air channels must be vertical and unobstructed. A few pieces of scrap wood to space off the floor the three inches. Extending out to both sides of the stove. Three inch screws should give a solid mount. While installing the second layer with the black facing out, I used small black screws (leftover from assembling my chimney) in the valleys and they disappeared from view, leaving a nice, consistent surface. All my holes I pre-drilled though, as this material only came in 26 gauge steel, which is pretty stiff to just lean a screw into. To me it looks quite good and finished - but the real test will be what Donna thinks! Looking okay for the first sheet. The second sheet really finishes the look. In Praise of Maier Hardware, Or How Dave Solved All My Water Tank Woes With One Insight. As outlined in my previous post, I was stressed and stumped about how to best deal with my overflow drain on the water tank. I needed to find an easy way to introduce air into the top of the tank (especially when the overflow line is in use, but generally at all times to offset any water removed from the tank). At the same time, I didn't want to use anything that might allow water to escape from the system. I was in a bind. My two solutions were to either put check valves on top of both the tank and the sight hose, which would mean that any overflow situations would have the pump putting pressure on the tank - something I was reluctant to entertain, especially with the factory specifically telling me not to do that. My other solution was to have the overflow pipe just drain out into my drainpipe via a non-physical connection. I would let the 1" poly pipe hang into the 1 1/2" abs drain pipe, and hope that it never backed up, and that fumes would be minimal if they travelled up the hose and hovered over our drinking water. On Saturday I completed a few service calls, realized that I was going to be too late to attend the open mat time at the dojo I have recently been attending, and so headed directly to Maier Hardware to return my huge collection of poly pipe accessories (from previous complicated notions) and instead pick up the parts to allow me to install one of my above solutions. Serendipidously, the owner Dave was there, and he was graciously willing to chat with me. I usually feel like I'm intruding on him, as we chat for ages - so it was with some guilt that I began to explain my woes to him. He reiterated his first solution to my problem. A rather clever arrangement of an overflow drain that lined up with the kitchen sink and had some sort of brass bell that would ring when the water flowed by. While a fantastic idea, I didn't think it had long term appeal to my wife, nor did I think that it would work as good in practice as it did in our minds eyes. Then he told me about a valve designed for P traps to prevent negative pressure from draining them. This was nearly perfect! He showed it to me and I got sincerely and really excited - it was readily apparent that his experience and thoughts were absolutely invaluable! Then he pointed out that this valve still had a tiny spring loaded clip to close it, and as such, there was a decent chance that it would prevent the backflow of water from the tank to the well from completely emptying the pipe, and that perhaps a foot or so of water may remain in the pipe from the well. This wasn't a good thing, as my heat cable only extends a few inches above the surface of the water from the well, and so if there was water in the pipe outside of the well, it would be very susceptible to freezing. Then he told me about his "first choice" of solution - extending a pipe from the top of the tank straight up in the air until it was higher than the pump had the capacity to pump. With shock, I realized that this was very possible - I could easily put a T on the overflow pipe, and put more pipe there that ran between my roof rafters until it was up in the attic. That would add on up to ten feet of stack - and the pump was probably already close to its limit of about thirty feet. I can't describe the feelings of relief and excitment at his tremendously insightful solution. I felt terrible walking away with only the purchase of a T coupler, instead of my other items, as it turned out a net loss for him - he ended up refunding me $20 for the other parts I returned. Then again, as if there was much doubt, he cemented in a dedicated customer (and some extra blog publicity). Returning home, I boiled up a hot rag and wrapped it around the fittings on the top of the tank. This softened up the poly pipe and made it easier to switch out the ninety degree bend for the new T coupler. Swapping a T coupler for a ninety degree bend. I installed about forty feet of poly pipe on this fitting and then with Donna and Kenny's help, snaked it up into the attic and just over the collar ties. This was a gain of about six or seven feet of head. No shortage of pipe here! And over the collar ties. The remainder of the pipe I brought back downstairs and Kenny lined up the pipe outside into a bucket to catch any possible water that got that far. Ready to catch any overflow - happily, he was disappointed! I had a sip of bitters to settle my stomache, and then hit up the pump for five minutes, when clearly only four would be required to fill it. My hands were shaking badly as I saw the water reach the top of the tank. I heard the change in pitch, and then the rush of water down the drain. The water moved up the sight hose until it reached the final bracket holding it to the wall, and then it stuck there. It didn't even rise to the sponge plug! Donna reported that she could hear and feel water shaking the pipe, but none was able to come out. I put the plugs in the sink drains just to be sure I tested it under all circumstances, and let it run for a full two minutes. Nothing bad happened, and when the pump shut off, the water level simply dropped back to a full tank. Cut to length and screwed to a rafter. It will get boxed in when I finish the paneling. Maier Hardware had saved the day with a simple, elegant solution that still has me smiling days later. And thus, the water system is complete (until my low flow kitchen taps arrive, and other cosmetic issues are addressed). As I type this, my hands are still shaking. Kenny has left the cabin and is reluctant to return. I am having a small snifter to calm my nerves, and will likely just take the remainder of the day off after cleaning up and going deep into thought. I only took the one picture, and then the events precluded me from taking any others, and now, there's not much to see - I'll try to paint a picture for your mind's eye. The morning dawned a bit overcast. The sky looked like cream of mushroom soup, but lacking the mushrooms... The weather bureau suggested that things would clear up slightly around lunch; I felt the same sort of optimism about the skies clearing up as Jeremy Freedman getting his first tube of Clearasil. Shortly after breakfast, I opted to head outside - as part of my "zone cleaning" routine, the outdoors represented the next zone to be tackled (preceeded by the sauna, followed by the entrance and woodstove). Kenny agreed to come with me and help out. He was in a mood to be of assistance today and I certainly didn't want to deny him. We started by hauling cardboard and trash to the garage to wait until such time as I could deliver them to the local waste transfer site. Kenny dragged his sleigh to the top of the driveway hill, but he was unable to get it to slide down, the ice on its bottom being rougher than a tramp steamer's barnacle infested hull. Returning to the cabin, Kenny assisted me in piling the last of this season's burnable wood in the slab shed. I piled, and he used his shovel to pry apart the frozen logs and slabs. They were so tightly joined you couldn't have gotten a ten penny nail between them with a sledge hammer! 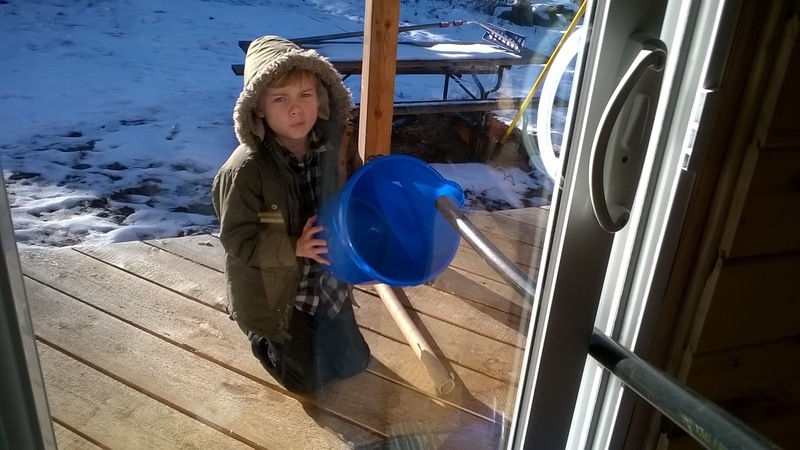 I give him credit, he stuck it out and even when I moved on to filling the wood bins and cleaning off the front porch, he didn't retreat inside to the sincere pleasures of his Lego or books. We came inside where I prepared a lunch of yogurt and jam for him, and nacho chips that were as broken as Steven Harper's dreams for myself. At least I had hummus to help me keep the fragments together. He'd probably be phoning me in to the RCMP for being the kind of person who enjoys hummus. After lunch dishes were cleared (who am I kidding? They're still on the table beside me...), Kenny headed upstairs to continue building the tallest Lego tower ever, and I proceeded to begin work on the drain under the sinks. I at first had the rather pedestrian notion to directly connect the two drains together, with a T in between to connect to the overflow drain from the water tank. Then I had the revelation that I could switch up the T in such a fashion as to allow a more direct connection between the overflow drain, and have a bend in the drain from the sink. This would allow me to open up more space in the front of the corner cabinet - never a bad thing. I cut, checked, rechecked, and did multiple dry fittings. In hindsight, it's better to check, recheck and THEN cut, but at least I only made one or two little errors. With trepidation, I glued the pipes together, careful to twist each connection to try to ensure ample coverage of the adhesive. At last, all was in readiness. Looking good from this angle. Maybe even looks like a real plumber installed this! With Kenny observing carefully below the sinks, as well as checking occasionally on the floor, I poured out pitcher after pitcher of water down both drains. Like an amateur electrician checking to see if a wire was live, he nipped a few quick taps on the drain to see if water had leaked through anywhere. He reported that his finger was both unshocked, and unwet (er, dry). Then, with great fanfare and excitement, I said I would test the overflow drain. Kenny climbed into an empty box that once held the sinfully sodium-soaked selection of beef flavoured ramen and said that in light of recent events, it would serve as his life raft. I punched in five minutes on the timer, knowing full well that this would fill the tank fuller than Papa's plate at an all-you-can-eat buffet. We watched intently as the line in the hose climber higher. And higher. And higher. It shot to the foam plug, and then did something different from the previous disaster. I was slightly bemused and actually took on the demeanour of a fool who thinks he's won just before he realizes that he's already lost. It moved below the level of the top of the tank and continued to drop. My smile followed the movements of the sight line as it plummeted to the very bottom of the tank in less than a minute. Good golly I said to myself - it's set up some sort of weird siphon that is actually draining the entire tank if you happen to overpump it! I began to feel like I was sixteen years old again, trying to ride my tricycle down a hill and then realizing that the pedals were turning faster than my feet could keep up! The sound of the rushing water was like the blood in your ears just as you are about to pass out, only this time, I didn't have the bliss of unconsciousness to relieve me. Horrific gurgling noises groaned from the sink drains, and then slowly, terrifyingly, unable to be comprehended by even the stoutest of minds, the water level in the tank began to rise again. In my lizard brain - the water leaving the tank had created a powerful enough vacuum within it that it had sucked a new volume all the way from the well and had begun the cycle again. Kenny, sensing my panic instantly, backed away from the tank. The tank, creaking and groaning from the immense negative pressure put on it collapsed like the 2013 Toronto Maple Leafs in the playoffs. I rushed up to the landing to see the top of the tank inverting like an upside down version of Cheops masterwork. I ran downstairs, inadvisable at the best of times on alternating tread stairs, and rushed under the sink. At first I tried to loosen the P trap, hoping that I could introduce more air into the line - why hadn't the sight hose been enough? Curses it for having a diameter narrower than Hank Hill's urethra! I couldn't budge the cap on the trap with my bare hands. Begging Kenny for the recently purchased jar lid opener, I scrambled through our kitchen utensils to find it, but in my panic, I couldn't get a grip on the incoming filter - I would have gladly accepted a gush of water from it, compared to the visions of the entire well having to pass through my tank and into our grey water system. Our well is 4' wide. It also usually contains in excess of 6' of water. This gives us a volume calculation of 75.6 cubic feet, or 565.5 gallons. Our tank is 31 gallons. We can fill 18.5 tanks before running the well dry. Also, the well will be recharging in the meantime. 18.5 repetitions of this horror? I couldn't imagine the greywater system handling 565.5 gallons without backing up completely. 565.5 gallons of water being pumped back into our cabin with no way to stop it. I redoubled my efforts on the P trap and managed to get it off and a little water drained out into a bucket placed with absolutely no care. I hit the pump button to try to relieve some of the pressure on the water tank by replacing some of the water that was being sucked out. At last, the water stopped gurgling, but not before Kenny had abandoned me without reservation. He thinks he'd rather live here than in the stressful cabin. I collapsed into my chair with relief at the glorious sound of silence - and the vision of the waterline in my sight hose holding steady only halfway up the tank. After a rather poor and interrupted sleep, I still find myself unable to think properly about the situation. But I feel like maybe I have some new insights. It is inconceivable that the suction created by the water running out of the tank had enough power to pull water from the well. The grey water pit is at least a few feet above the level of the well, so it is a physical impossibility that the water could come from there. Additionally the hoses on the top of the tank do not extend into the tank any distance - so unless the tank completely and totally collapsed, water couldn't continue to reach the outflow pipe. What I think must have been happening is that the water filled the overflow pipe completely, all the way down to the P trap under the sink. When the pressure from the pump stopped, that water still was being pulled down by the force of gravity. That water needed to be replaced by air in order for the pressure inside the tank to be equal to that outside the tank. Unfortunately, there are only three ways for air to get back into the tank. The first is through the incoming line from the well - and that's a dead end right off the bat. The end of that pipe is seventy five feet away and five or six feet under water. The second path is from the overflow pipe. From the top of the tank to where it drained into my sink drain is probably a good ten feet, with three ninety degree bends, followed by a coupler that probably reduces the diameter of the hose from 1" down to 3/4". That's quite a bit of water falling down for air to come back up through. I don't think the sink drain plugs were in place, but if they were, then the air would have had to have been sucked up through the P trap too. In fact, if the drain plugs were in place, the nearest air would have been a further twenty feet under the cabin at the Y junction coming from the bathroom sink (where there is never a drain plug installed, although I suspect that we have one we could use if we wished). The third and final path is the sight hose. This is only a 1/2" hose, at the bottom of the tank, going through a coupler that probably reduces the diameter down to about 3/8". It would have about seven feet of water in it when the pump was shut off. It would have taken a tremendous amount of suction to pull that water back into the tank. Now that I've typed it out, I think I may understand it a bit better. So it seems that what I was witnessing was not the water draining completely from the tank, just the force of the water draining out due to gravity pulling the water out of the sight hose. The vacuum in the tank caused by that water running out caused it to buckle and creak. There just wasn't an easy way for air to get back into the tank. I had thought that air would come up quickly through the sink drain, but obviously not as quickly as required to relieve the pressure on the system. I'm honestly not completely sure. During the night I lay awake with visions of one way valves and just allowing the pump to pump against pressure in the tank. I'm not sure how much pressure the pump generates at that height (not a whole lot I'd expect, it must be near its working limit) - but I don't know if I'd want to have it pumping into a suddenly sealed tank. I'll follow up with Dave at Maier and see what he thinks of that idea. I'd also have to put a valve on the sight hose to prevent it from being an outlet for the excess water. The other option that seems to make some sense is to return to the system as it was when I first tested the overflow - simply have the overflow hose "dangle" into a 1 1/2" ABS pipe. Exactly as the washing machine is currently working to drain. The only reason it failed the first time was because I hadn't put a junction on the drainpipe further along to keep the water in the system. This would remove one ninety degree bend, one coupling, about a foot of pipe and the very real possibility of the end of the pipe being under water from the equation. It would provide lots more air introduction into the hose as soon as the pressure is released. There wouldn't be a seal around the drainage pipe and the overflow pipe. 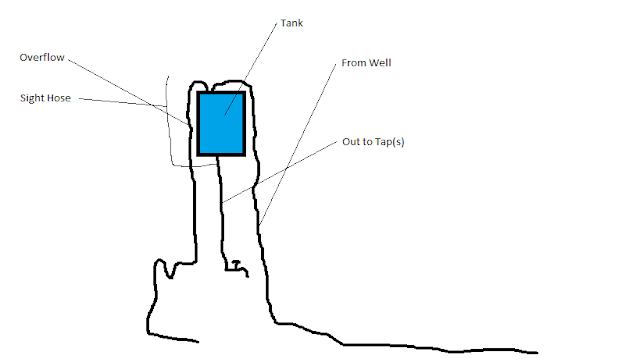 As soon as the pump shuts off, air would only have to head directly up the pipe and into the top of the tank, without being sucked through any other obstacles. I could still hopefully install this completely under the sink. There must have been a similar pressure on the tank during the first dramatic test, but it couldn't have been as bad because we didn't notice it (then again, maybe the water on the floor distracted us). Well, time to purchase more ABS fittings (and maybe pipe) and head under the sink to try another plan. I can't express how frightened I will likely be to test this once again. With the counter in place, there wasn't much left to do but to install the sink. Things were really coming together now - and in no way too soon! My friend J! and his wife L! were scheduled to arrive at the end of the week - and we still didn't have the ability to easily wash dishes. Consulting the Emsen installation manual (actually, a single sheet of paper), I flipped the sink upside down onto the counter and lined it up with where I wanted it to be installed. Lining up the sink and trying to keep it close to the front edge. I pulled the sink as far forward as possible - I had noted earlier that it seemed like it may be a bit awkward to wash dishes in the sink if it was set back much from the front edge of the counter - moving it back also moved it sideways (as it was a corner sink), so one would have to wash dishes while standing at an angle to the sink. This didn't seem like a good plan to me, so I wanted to minimize the chance that this would happen. Lining up the outside edges of the sink so that they were flush with the inside edges of the walls of the corner cabinet, I took out my super trusty Staedler draughting pencil and traced out the sink. Then I used my yardstick to reduce this outline by a half inch all around. With nerves all jangling, I drilled a few pilot holes through the counter flush with the inner rings I had drawn, and then inserted my jig saw (complete with a brand new blade) and began working my way around the pattern. At the front edge I hit some substantial resistance, so I skipped over that spot and came back to it later. It turned out I was hitting the metal bolt holding part of the two counters together - it was a redundant part according to the manual when you were installing a sink in that area, so I will try not to lose too much sleep over it. Definitely no going back now! I did a dry fit of the sink next, and it looked okay to me. Dry fit makes it look good. Then I installed the butyl tape around the edge of the sink. This was harder than the manual had shown - the tape was much wider than the space provided. I tried to keep it set back from the edge enough that none would show when the sink was installed. In hindsight, this was the wrong way to do it. I should have set the tape so it was flush with the long tabs under the sink, and some of the tape could or even should extend out beyond the edge of the metal. Then I installed the clips for holding the sink down onto the countertop and flipped it over and set it in the hole. It wasn't a hardship to tuck the clips in as I sought to seat the sink in the hole again. They did catch in a few places, but it wasn't a problem to push them in and then the sink quickly returned to its final position. I ducked underneath and then realized my next problem - the clips were designed for an Ikea countertop that was over an inch thick. My "custom" laminate countertop was only about a half inch thick. The clips would tighten down fully long before they reached the countertop. Along the back edge of the sink it wasn't a big issue. I got out more of my strapping and screwed it to the countertop along the back edge and the two shorter sections extending out from there. Just had to add my strapping to get the clips back to useable status. The front edges proved a bit of a head scratcher. I had lined them up flush with the inner sides of the cabinets to minimize that setback - but now there was nothing for the clips to attach to! Hmmm, nothing to gain purchase on here! I contemplated trying to drive in some screws and leaving the heads sticking out for the clips to attach to, but I couldn't get in there with my screwdriver, and the butyl tape had already stuck the sink in place so I couldn't easily remove it. Then I thought about replacing the clips altogether - that's when I started to really make progress! I knew I had a scrap piece of galvanzed pipe strap just out on the front porch. I cut it into a bunch of smaller pieces, and used them to replace the clips. One end of the straps I screwed tightly into the sides of the cabinet, and then I tightened up the adjusting bolt and the sink snugged down nicely. Ahhh! Clever lad! A makeshift clip! One complaint I may make is that the "nut" portion of the clips is a plastic part - I felt lots of fear that it could easily strip if you overtightened the bolt. I tried to watch and feel carefully for the sink to come down to the countertop tightly but without overdoing it. With the sink nice in place, Kenny grabbed a rubber and tried to erase the marks left around the sink from my pencil, and I went underneath to attach the "Atlant" drains. A previous error in working on my plumbing meant I no longer had a P trap for the sink, so at this point I put a bucket under the drain, and washed another load of dishes. Every day the laundry and dishes get easier to do again! A thing of beauty. Now if only I hadn't already messed up this P trap, I could keep going. What with the walls not being exactly square and me being cheap, I decided it would be more economical and give me a better fit if I did the countertop myself. First of all Donna and I measured what we thought the counter should be. We arrived at 66 inches along the east wall, and 57 inches along the south wall. Of course, this adds up to 123 inches, or ten feet, three inches. Sigh. I hummed and hawed at the Home Depot, juggling the value in purchasing two six foot countertops, or a single ten foot countertop. I opted for the ten footer, feeling that I could shave off a couple of inches from each direction as we had generous overlaps at the edges of the cabinets. Once at home though, it dawned on me that in the corner, I didn't really need the counters to meet - I had three 1" pipes heading through the cabinet and up to the water tank there, so I was already in need of that space. In the end, I pulled the counters out about six inches from the corner in each direction, thus giving me almost nine inches of extra material - my decision to purchase the ten footer was optimal! Awesome! To cut my teeth, I first cut off the 51" section of counter. I carefully taped the laminate side, and then installed a 100 tooth sawblade in my circular saw. 100 Teeth! This should hopefully make a smooth cut. Testing, will this work as a fence? Working slowly and using a level clamped to the counter as a fence, I made what I thought was an awesome cut! No chips out of the laminate, and it looked pretty straight to me! Next I cut the other length to 58" - astute readers will realize that this doesn't add up to my original 66" when I add on the 6" of space afforded me by not extending to the corner. This is because I decided to go 2" less on the overhang on the east wall, as we are planning on replacing the Panda washing machine soon with a larger machine, and I didn't want there to be a chance that the counter would overhang the lid of any future washing machines. I taped up the two mitre angles and cut them very carefully. Can hardly wait to see how it looks inside! Bringing them inside and setting them down, I was shocked at how wavy they looked. I could have probably cut them straighter just by eyeballing it! I took them both outside, reset the fence and cut carefully again. This time was better, but still not straight enough for my eye. So I trimmed the worst one down a third time, and then decided that because it met acceptably at the front and rear of the mitre, it would be acceptable. The gap in the middle would be of little consequence after I removed most of that area for the installation of the sink. Actually, this time I cut from above with no consequences. I would suggest doing it this way in the future. Now I wanted to install some mitre bolts - so I pressed my cordless "router" into service and routed out some clover shapes under the mitre cut to accomodate the bolts. Checked the depth twice, and then really tightened down the nuts - this isn't the time when you want to cut right through the whole counterop! Need to fit this bolt in place. And my freehand mitre bolt insets. I schmutzed up the two halves of the joint with clear silicone, and pressed them together. Then I installed the bolts from underneath and worked hard at keeping them in the insets while tightening them up. Once they were tight, I came up top and wiped off the excess silicone and tried to ensure a nice, flat seam. Then I went back underneath and drove in a number of screws to hold the countertop down onto the cabinets. That was enough for the day, but it gave me a great work surface to set up to do a load of dishes in our basins. With the junction of the floor and walls finished around the kitchen corner, and the corner cabinet in place, it was a simple job to install the remaining two cabinets. Levelling of course took a bit longer, and in fact, there is still one corner that is much higher than I'd like, but I can't see how it can be properly adjusted, and so I have the support post there a tiny bit off the floor and hope that it settles over time. Testing the fit of the drawers and door. I next decided to install the drawers on the smallest cabinet to see just how high up the front of the cabinet they came. Of course, they came up nearly flush with the top. This was fine, but it did mean that I had to accomodate this situation before I could install the countertop. As with many laminate countertops, this one had a rounded over front edge, that extended downwards a half inch. You can imagine my disgust if I had installed it, only to find that it prevented my drawers and doors from opening! It wasn't a big challenge to install some 3/4" strapping all around the key points of the counter. I had purchased a bundle of this strapping at a ridiculously low price and keep finding more and more uses for it. Now that the unit was all screwed together, and to the wall, it really began to feel sturdy and to give a good idea for where the kitchen was heading. With the corner cabinet in place, the next logical step was to attach the two cabinets that were to reside on either side of it. Before I wanted to get them settled into place though, I wanted to try to seal the junction between the walls and the floor with a bit of caulking, as well as a rough "baseboard" - it wouldn't be visible really, under the cabinets and all, but I wanted something a bit more substantial than just the caulking. First up was trimming off the foil and plastic air barrier that extended out below the wall boards and onto the floor. This would have been so much easier if I had done it before the cabinet was put in place, but I was so happy to have Grandpa's help at that moment, that I didn't think that far ahead. Luckily my head JUST fit under the cabinet, but that still didn't get me far enough under to reach the very corner. That's when I had the bright idea of fitting someone smaller into that spot - Kenny was more than happy to take a break from his studies (still Minecraft!) and come over to help me out. With my direction, he did a fantastic job of trimming the air barrier to size, as well as helping to adjust the corner support post. I was so happy and impressed with his work. Trimming off the excess air barrier. Once the hard stuff was done, I tried to caulk underneath. Unfortunately, the space didn't permit the caulking gun to get the right angle, so I ended up spreading the caulk mostly with my finger and lots of grunting and groaning, and then a sticky cleanup. Rats, the tip doesn't quite line up. I was able to fit the brad nailer though, and so the baseboard went on tickety-boo. I was happy with the result, and was able to proceed with the installation of the other two cabinets. In the aftermath of the second great flood of our cabin, I had time to think about other ways in which I could try to head off future issues. I had noted that with the size of the new water tank and the speed of the pump, it would be the rare time that anyone would ever need to run the pump for longer than five minutes. The only switch I could find went two levels beyond this though, with a ten and fifteen minute option. During our installation of the corner cabinet, we had bumped up against the head cable switch and pulled the buttons right off of it. I was able to find the buttons and snap them back in place, but now that memory came back to me. These things just pop off! With a fine screwdriver, I coaxed off the buttons for the pump switch and examined them more carefully. They had long plastic tabs on the back side that would press microswitches within the switch body itself. I only really need those bottom three buttons. The unadultrated switch from behind. With side cutters, I removed the top two tabs for the ten and fifteen minute settings. I replaced the switch, and hit up the ten and fifteen minute buttons to no effect - a success! You can see the little light at the bottom doesn't change, even with the 15M button fully depressed! I didn't accomplish much the day following the installation of the water tank. I spent much of the morning doing a bit of laundry, and washing up the dishes that had accumulated while our water supplies were so diminished. I did remove the water filter (after much cursing!) and re-wraped the threads of the connectors with much more teflon tape than previously. I did a bit of research, and the most sensible advice seemed to indicate that you should put only one or two wraps at the beginning of the threads, but then build up larger and larger amounts as you get further up the fitting, so that you can be sure that it is getting tighter, the further you are twisting it. I did manage to also get the water sight line straightened and clamped up the wall, installed a bit of sponge in the end to keep dust or anything else out, and then Grandpa showed up with the mail. I added a second strap about halfway down, just to be sure! We observed the tank and I showed him that I had already pumped it a bit. I related that I was too scared to pump the tank completely full. This was irrational, as if it was going to fall off the wall, the sooner it happened, the better, as I was always adding stuff below it that I wouldn't want crushed. So, with Grandpa and myself watching, I punched in five minutes on the pump timer, knowing that the tank was already almost half full with two minutes of pumping in it. The water level is almost at the critical spot! Tension is building! Kenny came down to supervise, and Grandpa and I both watched the water climb higher, and higher. Finally, it reached the top of the tank, and I could hear water start to gush through my emergency overflow pipe and down the drain. At the same moment, the water moved rapidly up the last few inches of the sight hose and stopped at the sponge. I wanted to make sure that water wouldn't actually rise above the sponge - that would negate the usefulness of the overflow pipe and would still be a terrible tragedy - I didn't want squirts of water to be shooting into the cabin! Craning our heads upward, Grandpa and I were both mesmerized by the sight of the water stopping at the sponge and holding there, listening to the water gurgling down the overflow pipe. Suddenly Kenny broke the magical moment by asking "Why is there water all over the floor?" My eyes snapped down to the gushing flow around Grandpa's boots, and for the second time in two days I found myself desperately mashing the off button on the pump while scrambling for towels (all of which are of course, in the sauna) or anything to dry up the mess. I grabbed all the mats in the house and threw them down. Kenny got tremendously excited, and threw all our kitchen sponges on the floor to help soak up what he could. Grandpa made himself scarce again as Kenny and I cleaned up the water and I put on an early fire to try to dry things out as quickly as possible. The aftermath. All our mats are outside dripping and awaiting a good cleaning and drying session. What could have allowed all that water onto the floor? I was going to have to CSI the heck out of this! Gosh, even the arc of the side of the T was working against me in this case. Kids, don't half-finish your jobs before testing them! I hadn't completed the other half of the drain system - the part where the washing machine hose would ultimately be placed in a P trap. Instead, I had decided to just jam the hose down my drainpipe and leave the T open. Water coming in from the emergency overflow to the right of the picture just ran right across the T and out the left side, around the washing machine hose.